Koror/Dusseldorf, January 21, 2012 – Blue Corner in Palau is probably the most famous dive site in Palau and regularly ranked among the top 10 dive sites in the world. 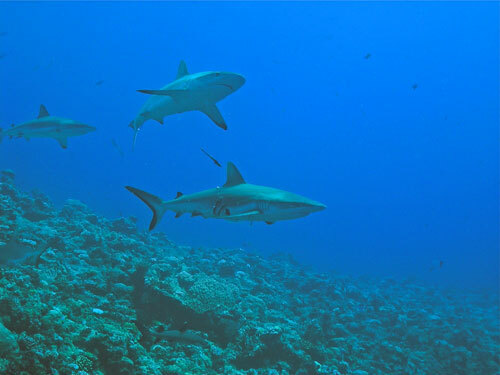 With its healthy, resident population of grey reef sharks and black and white tip reef sharks, Blue Corner is high on the wish list of every diver interested in sharks. 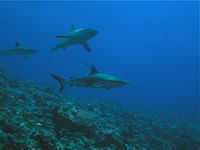 But not only the top apex predator makes diving here so spectacular. The vertical reef wall, that drops down to 1,000 feet/330 metres, brings rich nutrients from the bottom of the Mariana trench, attracting barracudas, snappers, jacks, eagle rays, turtles, wrasses. All these species and much more can be seen in one single dive while drifting in a brisk current. With the PADI specialty course, divers can now appreciate even better this unique and prime dive spot. Sam’s Tours staff biologist Ron Leidich has created the PADI Palau Blue Corner Diver Specialty especially for Sam’s Tours customers to teach divers why Blue Corner is such a consistently phenomenal dive. This PADI Distinctive Specialty will enhance a divers knowledge about this incredible dive site. The course consists of approximately two hours of informative lecture, and two dives at the Blue Corner. The two required dives are incorporated in a standard 2-tank dive day with Sam’s Tours.